Christmas is usually a special time for Christians all over, especially the children. 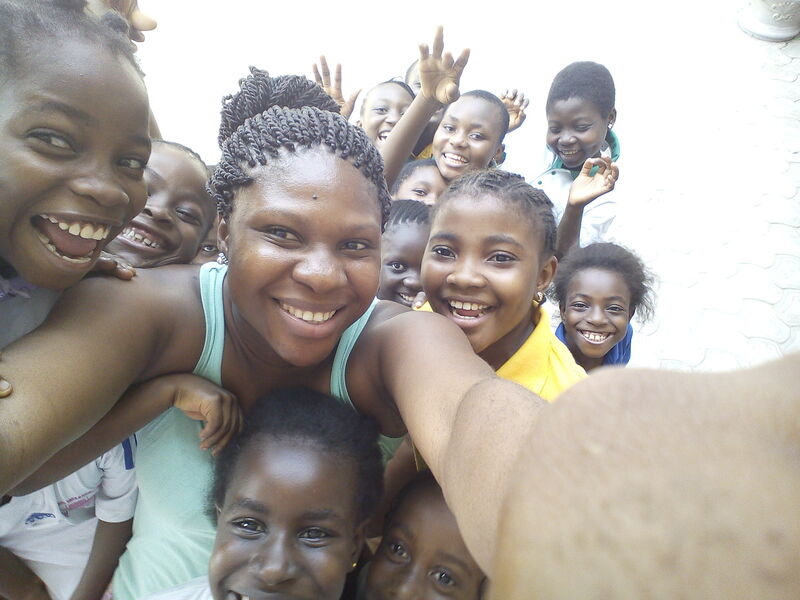 So to understand what children really want for Christmas, our Public Relations Officer, Njideka, visited the children of the Ark of the Lord Missionary School, Ajah, on Friday. From the cheerful answers they gave, we can rightly say that the kids just want to have fun this Christmas! The children, who were excited to talk about anything Christmas, were asked to answer the question “What do you want for Christmas?” “I want a puppy”, “I want a doll”, “I want a bicycle”, “a dress”, “a PSP”, “travel abroad”, “an Ipad”! However, one thoughtful child gave an outstanding response, “I want a visit to share my gifts with the orphans”. These were the various answers they heartily shared with Njay, who also advised them to add giving to their list of wants, because that is the true essence of Christmas. Njay briefed them on what the Disadvantage to Advantage Initiative was about and enjoined them to always be thankful to God and their parents or guardians for being able to give them a good education as that is mostly what our #D2A! kids were in dire need of. They were also given drinks and biscuits to set an example of giving for the reason of Christmas and some of our #1000Christmas flyers to give to their parents to encourage them to support. Having heard what the children want for Christmas, we are sure that our plan for the Santa Drive is a step in the right direction. Every child wants to have a good time, and at least one good gift at Christmas. 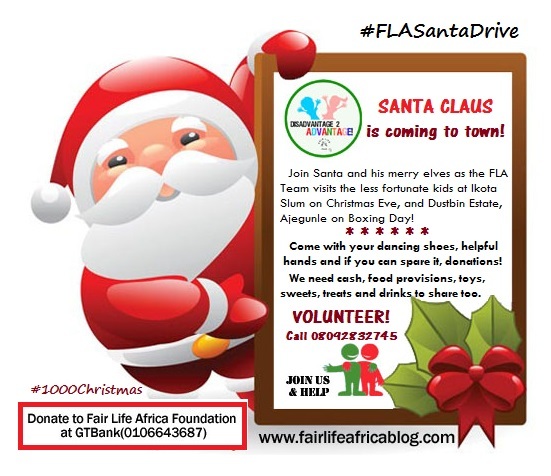 So to truly bring the spirit of Christmas to #FLAKids, we have concluded plans on taking Santa to Ikota Slum and Dustbin Estate, Ajegunle come 24th and 26th of December. We’re going in full gear with our DJ and cheerful team! We already have packed goodies for the 10 families of the Disadvantage to Advantage Kids and 200 more children at the two locations. What is remaining is you and your beautiful gifts/donations and of course, your presence on both or any of the days to help share the sunshine of the Christmas season. Do get in touch to lend a hand! You can also donate to Fair Life Africa Foundation at GTBank, 0106643687. Thanks! Previous Post What Does N1000 Mean To You?